Before I get to talking about Cloak And Dagger - and the subject that I really want to open this review with - I feel that first of all I have to talk about a certain part of my past. I have to talk about that certain part of my past so you can see where I came from, and how it shaped my thoughts and feelings to this present day. That part of my past I wish to tell you are my younger years, the time before I became a teenager. You see, when I was a child, my upbringing in many ways was kind of sheltered. When it came to being exposed to popular entertainment during those years, it was almost entirely (if not totally) very safe stuff. The Muppets on the small screen and the big screen were okay, old Warner Brothers cartoons every Saturday morning were allowed, and I would be taken to every G-rated Disney movie that came to my local movie theater. There was not much else that I felt that my parents would allow me to watch. I never got to see shows like All In The Family or Three's Company when they were originally on the air, and seeing movies rated higher than G were a rarity. I remember seeing movie posters for stuff like Gallipoli and being greatly intrigued... but in my heart I was pretty sure that my parents would say "no" to my request to seeing these movies. I finally got to see an R-rated movie when the MAD Magazine movie Up The Academy came out in 1980. Actually, the more liberal movie classifiers of British Columbia gave it the equivalent of a PG rating, which is probably why my parents thought it would be pretty safe. You might think that seeing a raunchy R-rated movie as a kid would have made a big impact. But for some reason, it didn't. In fact, I quickly forgot the content of the movie, and for years afterwards I remembered more about MAD Magazine publicly disowning the movie instead. In my early teens, my parents finally got a VCR, and for some reason they let me immediately rent and watch all sorts of R-rated and unrated movies that had tantalized me for years earlier with their descriptions and publicity art. I never quite figured out why my parents all of a sudden became more liberal. Maybe they thought that being a teenager instantly made one more mature. Anyway, despite my habit of watching lurid movies right up to today, I think that I came out all right - I am law abiding and responsible in my private life. Sometimes I wonder if it was because of the restrictions placed on me as a child. Which brings up the question: If on the highly unlikely chance that I was to father a child, how would I bring him or her up when it came to popular entertainment? Well, that's kind of a tough question to answer. Family entertainment, for one thing, has become a lot more raunchy than when I was a kid, with modern family films sporting everything from farting to foul language. Part of me would not want to continuously expose my child to such barbed and low-brow elements. But at the same time, I know that there is a certain danger if you do not teach children that the world they live in has some dark elements. Maybe I came out okay, but I can't speak for every situation for a child. I think what I would do is make a compromise myself. Certainly, I would look out for plenty of intelligent and safe entertainment for my child. But at the same time, I would on a regular basis throw in some more mature material into my child's pot. When I would do so, I would make sure to watch it with my child in case he or she had questions or became upset while watching the movie in question. And when the movie was over, I would try to engage in conversation with my child about the movie, asking questions such as: Did you like the movie? Was there anything you didn't like? What would you have done if you were one of the characters in the story? Was there anything you didn't understand? Hopefully, as a father I would be able to teach my child through films that there is not only epic adventure and laughs in this world of ours, there are also some dark elements out there that you have to prepare for just in case. Of course, I realize that a child's mind is much different than that of an adult, and as a parent you have to think back on your own experiences to judge whether or not a movie is appropriate. Which brings me to the movie I'm reviewing here, Cloak & Dagger. I saw the movie as a kid when it was in theaters, and I remember liking it... but at the same time, I remember thinking that there were some parts of the movie that were really harsh, harsh enough that kids around the same age that I was could find these things upsetting. Recently, I stumbled upon a DVD of the movie, and I decided to watch it with a new set of eyes - the eyes of a mature adult - to see if I would have the same reaction. The central character in Cloak & Dagger is a young Texan boy named Davey Osborne (Thomas, E.T.) With his mother dead, and his Air Force father Hal Osborne (Coleman, The Man With One Red Shoe) busy at his job, Davey has turned to fantasy as a means of escape, specifically with the role playing espionage game "Cloak & Dagger". Davey is so into the game, he imagines the game's fictional hero, one Jack Flack (also played by Coleman), as his imaginary sidekick, one who is both a friend and someone to turn to for advice about anything. One day in town, Davey stumbles across a man who has just been mortally wounded. The dying man hands Davey a video game cartridge and urges him to get it to safety. Davey immediately reports what happens to the authorities, but they don't believe him, mainly because the wounded man has disappeared. Soon afterwards, Davey learns the hard way that there are some very bad people who want that video game cartridge, lead by one man known simply as "Rice" (Murphy, Count Yorga Vampire), and Davey's on the run. Though Jack Flack is always there to lend advice to Davey to elude the bad guys whenever they get close, Davey eventually realizes that he may eventually have to rely on his own skills to get out of this bad situation. I imagine some parents who come across Cloak & Dagger might think it's a relatively safe family film, seeing that it got a PG rating from the MPAA and that it has child actor Henry Thomas in it, fresh from E.T. However, I am sure many of these parents will be shocked by a good deal of its content; my recollections of the movie's sometimes harsh tone proved to be accurate. (Warning: Some major spoilers ahead.) The young Davey sees a man shot in front of his eyes, and witnesses the shot man fall down a stairwell. Later, bad guys break into Davey's home and try to grab him. A little girl is held hostage and is threatened to be killed if Davey does not cooperate. The same little girl later unknowingly carries a time bomb ticking to a timed point to explode. Davey is shot at on more than one occasion, and at one point someone tries to stab him in the gut. Later, Davey stumbles upon the body of a man who was shot in the eye. Further on, Davey is chloroformed and abducted by some nasty people. A bad guy threatens to shoot Davey in the kneecaps and stomach, and Davey is forced to shoot him. As you can see, Cloak & Dagger has some rough stuff in it, stuff even adults might find harsh. The question comes up as to whether the movie is appropriate for kids. Actually, I think it is. I will admit that children under the age of eight or so may need to see it with parents, who will be able to assure their children that things will work out in the end for the youthful hero during the rougher portions of the movie. But the harsh material in the movie will provide a good lesson for kids of any age as well as their parents, that lesson being that violence in real life is not fun and games. In a world of family movies concerned with moronic slapstick violence, this lesson is both educational and a breath of fresh air, and will stay with viewers for a long time afterwards. It certainly made an impression on me when I first saw the movie all those years ago. Despite what I said in the previous paragraph, I am not saying that Cloak & Dagger for the majority of its running time is a harsh life lesson. The primary aim of the movie is to entertain, and I was just as entertained by the movie as an adult as to what I recall from first seeing it as a child. One thing I liked about the movie was that while its prime audience was clearly children, it did not dare to be dumb or simple-minded. The story unfolds in a way that did not insult the intelligence of this adult viewer, though at the same time it does not confuse any kids who may be watching. Every viewer will be on the ball at any time in the movie, and they will also find the movie's occasional attempts at comedy relief accessible to all as well. Wisely, screenwriter Tom Holland (Fright Night) and director Richard Franklin (Running Delilah) confine almost all of the humor to the first half of the movie, before things start to get really dark for the youthful protagonist. As the movie started to get darker, one thing that struck me was how much of the movie had a Hitchcock flair to it. There is of course the theme of an innocent person on the run, but there are also individual moments like the scene taking place on a riverboat or the race against time climatic portion of the movie, that are so suspenseful enough that you could almost swear were conceived and constructed by the master director. This should come as no surprise if you know the backgrounds of the writer and director of the movie. Holland the previous year wrote the screenplay for Psycho II, and director Franklin (who also directed Psycho II) was heavily influenced by Hitchcock throughout his career. In fact, Franklin gives another tip to the hat to Hitchcock with the casting of two certain veteran actors in two pivotal roles in Cloak & Dagger, which I will not spoil by revealing them or what their past connection to Hitchcock was. But I can certainly talk about the principle players in the movie, Henry Thomas and Dabney Coleman. Thomas gives a very good performance as Davey. Though Thomas in real life was starting to approach his teens, Thomas manages to convincingly play someone a little younger. Part of that is due to the fact that Thomas does not make his character an annoying precocious brat like what's found in so many recent family films. He comes across as smart for his age, but not perfect; he more often than not has to struggle, and this makes him an appealing hero. Though Thomas does a fine job, the actor who really steals the show is Dabney Coleman. Coleman has to play two completely different roles, a father to a young boy and a super slick secret agent, and manages to do a great job in each role. As a father, he manages to make his character appealing despite his faults, such as the fact he does not believe his son at first. Though he at first disapproves, disbelieves, and is busy with his job, we all the same sense that he does love his son; he's just lost his way temporarily. As secret agent Jack Flack, one can sense that Coleman is having a ball with the role, acting super slick and confident, and his obvious joy is great fun to watch. It's interesting to note that with both roles, Coleman doesn't stay on the same note; one character becomes more sympathetic, and the other starts to lose sympathy. 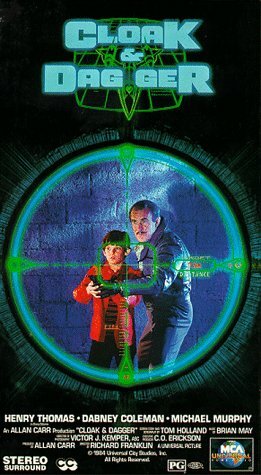 Probably you can figure out who wins out at the end, but aside from that predictable plot turn and a few other minor flaws (like some blatant product plugs for Atari), Cloak & Dagger is a true family movie, meaning that it manages to entertain both kids and their parents.